I am saying that all predictions concerning climate are highly uncertain. As a young man he worked for General Atomics on the nuclear-powered Orion spacecraft. [. In 1957 he became a naturalized citizen of the United States and renounced his British nationality. Dyson has lived in Princeton New Jersey for over fifty years. 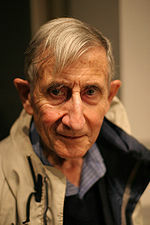 Freeman John Dyson FRS (born December 15 1923) is a British-born American theoretical physicist and mathematician famous for his work in quantum electrodynamics solid-state physics astronomy and nuclear engineering. Dyson is a member of the Board of Sponsors of the Bulletin of the Atomic Scientists.